My prayers are with Jennifer and her family as they welcome home their baby boy, finally! Thanks for hosting this week, Grace! This week’s 7QT’s post is probably the most depressing one that I have done! There is so much evil and sadness going on in the world, but we must remember that God reigns and love conquers all! A few months ago, my husband and I watched a 2009 pro-life documentary on this issue, Maafa 21. It’s sad that so many people are ignorant about all of this or don’t care, especially the Black community. Speaking of documentaries, there is another one that is definitely worth watching that talks about a massive problem in our society right now. Absent, by Justin Hunt, discusses the impact that uninvolved fathers have on their children. It features John Eldredge, Father Richard Rohr, Metallica frontman James Hetfield, and others. This movie has definitely added to Adam’s passion for promoting the importance of fathers. I believe that it is available on Netflix. Of course, I can’t neglect the tragedies that have occured in Boston, MA and West, TX this week. Things like this can be difficult to understand. 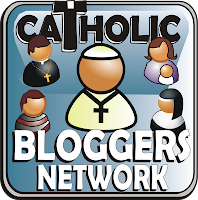 I’m reminded of a short book that I heard about last year on EWTN’s Women of Grace, titled Why Me? 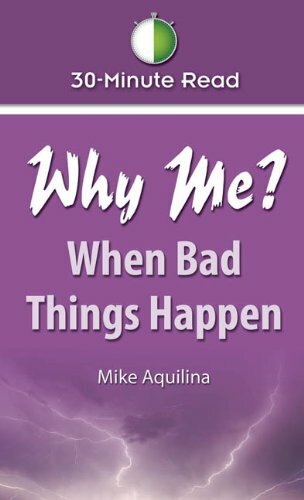 When Bad Things Happen, by Mike Aquilina. I haven’t read it yet, but saw an interview with the author discussing the book. It may be helpful for some people. And I will ask the Father, and he will give you another Counselor to be with you forever – the Spirit of truth. The world cannot accept Him, because it neither sees Him nor knows Him. But you know Him, for He lives with you and will be in you. I will not leave you as orphans; I will come to you. Changing gears a little bit… I am excited to feature a talented singer/songwriter next week, who is bringing hope to others with her music! She is getting lots of airplay in London right now and you may have heard one of her songs played on Fox News a few times. Be sure to read April’s Dreamer in the Spotlight post next Friday to learn more about this artist and her music! Have a blessed weekend! 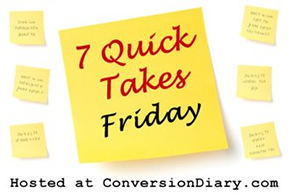 Be sure to check out the other 7 Quick Takes posts, as well!